Blurb : The End of A Quest? There it lay, the fabled holy sword of Karith, within the onyx alter just as the legends told. As you step over the corpses of the final guardian creatures, you shift your shield to your back. Your thoughts turn towards your triumphant return with this wondrous item of legend. But as your hand reaches for the hilt, the wizard screams. Turning, you see a gathering blackness, containing a monstrous winged figure that is blacker still. Your nostrils fill with the sulphurous vapours of the Abyss and you have hear it's booming voice, freezing you where you stand: FOOL! Did you believe I would let this be so EASY? Wicked Hiding Places. Need a difficult hiding place for that holy sword your paladin is questing for? Then Demons and Devils is for you! 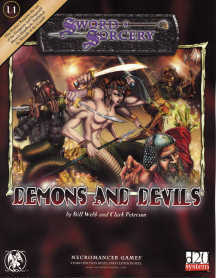 Demons and Devils is the first module in our "Lair" series, a set of modules containing short adventures useable in one or two game sessions for the overworked Dungeon Master who doesn't need a full scale dungeon. Published under the D20 system, Demons and Devils contains three short, difficult dungeons: The Sorcerer's Citadel, "Ras Evil Grin" and The Pit of Despair. Each of these is a perfect hiding place for items a party may be questing for. And, in the fine Necromancer Games tradition, each of these short dungeons centres around a demon or devil which guards that item. We've made the dungeon, you decide what you want to hide there. Now sit back and watch your players try to get it! The Module : To say Necromancer games is true to its motto of "third edition rules, first edition feel" in this collection of three adventures is selling them short. Yes each adventure is hard, for high level characters and an old style dungeon bash, but they are not done like the Temple of Elemental Evil where the idea seems to be, "how many rooms can we fit onto this rectangular piece of graph paper, and how many sheets/levels do we want". These have far more thought in their design and as the module is split into three dungeons it means that each one is not to big, so that the PC's adventure endlessly in extreme conditions, or too small so that the adventure is a single room trap. Before I review each of the adventures a note about the 21 page web site download that is available from the Necromancer Games website. There are two views. View a) says; What! That it's a bit crap to buy a module and find that two fifths of it you have to download and print off yourself, and who says you even have access to the internet anyway! Alternately view b) says; Great! Free stuff to make the adventure bigger, free support! I think it is a fine dividing line but if you get good value for money for the goods you actually purchase then it's ok to provide the customer more support on the net, saving printing costs and achieving the status that the provision of web support and downloads gives. If the module is two pages with a password for a 30 page web download, and the cost is £7.00 then it's a con. Thankfully Necromancer Games give value for money and there are such things as Internet Cafes in the world. Good Points : Made in a classic mode of a dangerous dungeon bash. Additional information available on the web. Three good dungeons in one module. Bad Points : These are a specific type of adventure and may not easily fit into an existing campaign. The trap filled dungeon is not every DM's cup of tea although these are more thoughtful than most.